We understand your market and specific needs. A mobile workshop with a longer deck for more space to work with. Vehicle shown may have optional accessories and is provided for illustrative purposes only. This versatile workhorse comes in unlimited configurations. Its fully customizable modular design boasts a virtually indestructible bumper-to-bumper all-steel unibody construction that can carry 3,000 lbs., and tow another 6,000. The 48V battery pack will ensure long-lasting power and reliability. Several option packages are available, such as our popular heated cab package. Other options include a 7-drawer tool chest, oxygen/acetylene tank holder and multiple lockable compartments. A rugged, multi-purpose vehicle that offers safe and efficient performance in any environment. Offers greater strength, balance and stability for improved performance and safety under any conditions. Exceptionally solid and rigid construction boasting an automotive-inspired heavy-duty chassis. Reinforced at all high-stress areas. Easily accommodates add-on components. Cooked at a high temperature for outstanding rust protection. Base colors include Federal Yellow or Safety Orange; unlimited colors available upon request. Ensures a smooth, comfortable ride over rough floors, resulting in less operator fatigue. Wide range of flexible options: pneumatic or solid; non-marking; traction or rib. Specifications and standard equipment are subject to change without notice. Our most popular options. Packaged for your convenience. Customers often order the same group of options. So we created a number of packages to make building your perfect vehicle easier than ever. The road to the perfect vehicle is paved with options. If one of our option packages isn’t quite what you need, our long list of options will fit the bill. Here are just some of our more popular options. Contact us for the complete list. A little or a lot, customization goes a long way. Starting with greater productivity and safety. Less maintenance and lower TCO, too. Whatever the degree of customization needed, our engineering team will get your vehicle to you quickly and for less than you might think. Our handy ordering and quote request tools also make the process extremely easy. 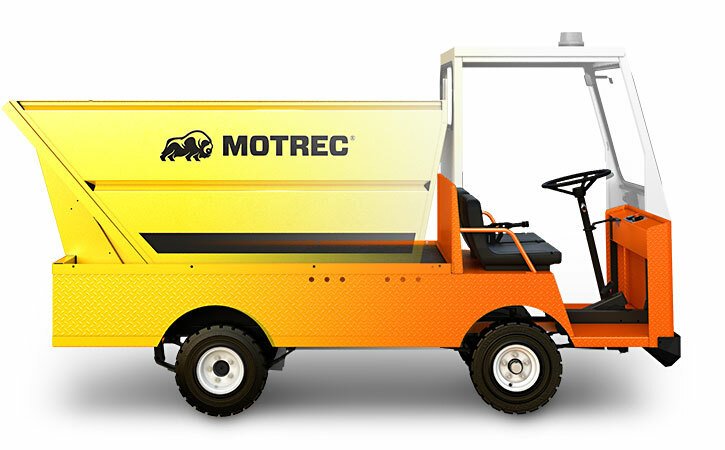 Every Motrec vehicle is engineered to offer years of reliable, low-maintenance performance to help you boost productivity and lower TCO. Find an expert near you. Our team is always available. © All Rights Reserved. 2019 Motrec International Inc.